I hope your Christmas Day was lovely! We had a wonderful day filled with happy children playing with new toys, good food, relaxation and learning. I have the pleasure of having my whole family together for the week between Christmas and New Years. This has had me thinking about activities that our family could do together to make happy memories. I am always eager to spend our time together wisely because once normal routines are back in place we are all more busy and less able to spend large chunks of time together. I hope you have some time dedicated to be together as a family! It is pretty cold in here in the Midwest. Tonight it was -1 degrees when we went for a family drive. So, since we are not interested in getting frostbite, we stay indoors. Reading is a wonderful activity for a family or for yourself. Some of my fondest memories as a child were sitting near my mother listening to her read us books. My two youngest are too little to sit and listen to longer chapter books, but they do like to listen to their favorite picture books. Whether you are reading a longer story all together, reading shorter books to little ones or sitting down to a good non-fiction or fiction book, read! I have committed to going through an art course and a couple of business-related courses that I purchased through Udemy. I don’t get a lot of time to learn uninterrupted these days, so with Cody home and my girls keeping each other tired, I may actually get some time to learn more. There are so many other wonderful online learning sites to consider learning something that you have put off. I will create another post with my favorite online learning sites. Depending on where you live, you will either enjoy sledding, snowshoeing, snowboarding, cross country skiing or snowmobiling…or you will simply go outdoors and do whatever you want because it is not frigid outside. We plan to go sledding at a local hill and we have discussed with another couple about going skiing/snowboarding at a nearby resort. There are no mountains here, but we can pretend on our hills. My family started a tradition of always seeing a movie at the theatre during Christmas break. I have continued this tradition with my own family. We have tickets to go see Coco. We also love to pick a few family favorites and watch them together. We try to be strategic about when and how many movies we watch because I believe there are better ways to connect as a family. We don’t live near family, so we are eager to get together with our family away from family, which is our friends. This is fun for Cody and I and super fun for my kids because they have other people to spend time with other than their sisters. Sisters are awesome, but they are together a lot! If your friends haven’t arranged something, plan a party or arrange a small get together. Sometimes I overthink getting together with friends. I think it is more about being with others than the details. We usually revolve our gatherings around simple food and games. My husband is not a big board game fan, so that is sad, but with a few friends I can convince him. So, combine getting together with your friends and your favorite board games and you have a recipe for a good time! I also love card games and interactive games. Games are a fun way to add structure to your family or friend time. Some of my favorite games: Dutch Blitz, Clue, Taboo, Guesstures, Catch Phrase, Coup, Settlers of Catan. Something I have regretted about past family time is not documenting it well enough. I have had holiday breaks with parents, grandparents and extended family and either didn’t take photos or did ask questions and keep a record of the experiences and lessons I gained during the time we were all together. Don’t forgo experiencing things in real-time to document every little thing, but snapping some pictures or recording voice or video doesn’t have to take long and it will be cherished for a long time. Last Christmas we each made a video of ourselves answering some questions and I am eager to see all of these videos put together. It will be so special to look back at our thoughts and looks in years to come. We have also simply asked Cody’s parents how they met and fell in love and I recorded it on my phone. It is a treasure to hear their voices telling their stories. For Christmas we got our kids a year pass to the children’s museum in town. I am excited to be able to use it during the cold months. They offer indoor active fun along with story times and art. There are also still several museums we have yet to visit since we moved here. Since my youngest is only one years old, I don’t venture to museums often, but I think it would be fun with older kids. Consider going on a day trip somewhere or even a full on vacation. I know many families who do this and really enjoy there time together in a new place. 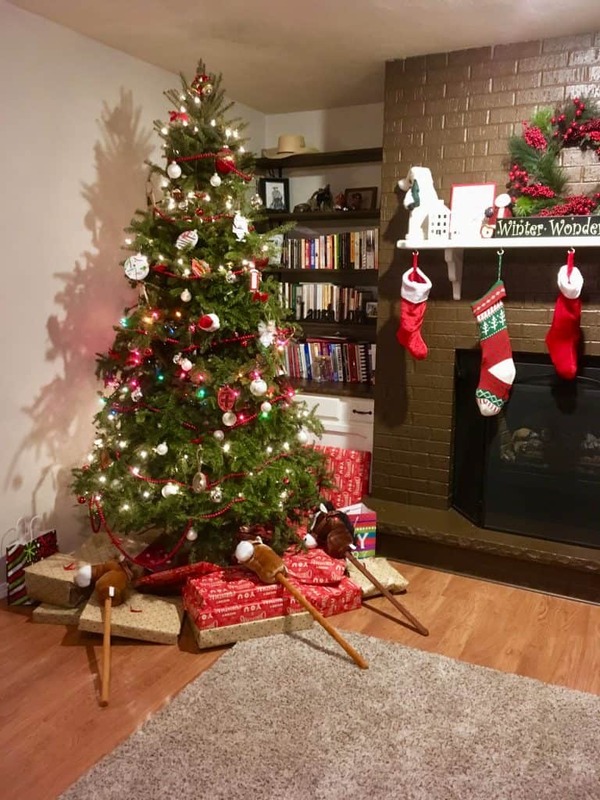 I imagine the traveling part is complicated, but the actual Christmas stuff is likely simplified since you are away from home. Either way, changing the scene when you family has time off can be a much needed reboot. I have been researching local organizations that accept volunteers and I am so impressed with my community. There is still so much need and it doesn’t end after Christmas. I am committed to helping more and this could be a great, memorable activity for a family. Check out this website for volunteer opportunities near you. The most important part of winter break is that you use it with the people you love. Despite the size, age and financial status of your family, quality time can be had. 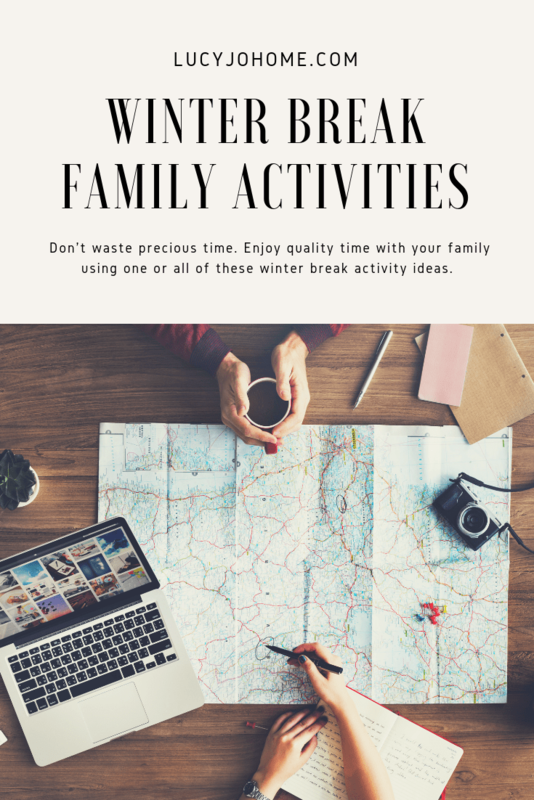 I hope these ideas can inspire you to enjoy your break that much more!